Tampa photography, design, and art services. Aurora PhotoArts Tampa Bay photography and design. Tampa Bay, Florida. 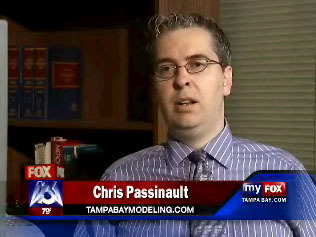 Aurora PhotoArts lead photographer and owner Chris Passinault interviewed on FOX 13 with Tampa Bay Modeling, one of the top modeling web sites in the world, which he also owns. Passinault, who specializes in modeling and talent photography, is a modeling and talent expert. WHAT YOU WANT. WHAT YOU NEED. YOUR BEST TAMPA BAY PHOTOGRAPHY, DESIGN SERVICES, AND ORIGINAL ART! UPDATE 09/15/13 - A new era. This Aurora PhotoArts marketing and support site, currently a Venus Class site which has been our main marketing and support site for many years now, is about to be replaced by a brand new Mosaic Class site. In the coming days, however, it will no longer be our main site. The old one under Passinault.Com will also be replaced with a new Mosaic Class marketing and support web site. Although the Venus Class site has been successful, there are only two in existence, and the sites are now outdated. Two sites do not make a fleet. They will be retired this Fall. Work continues on an enhanced Venus Class site, the Venus 3, although we have had issues with the centering of the site design and the placement of the floating tables for content. Once this issue is resolved, and passes testing, we may offer the updated Venus Class site for sale to our clients. This said, even if this happens, the sale of Venus Class sites to photographers and photography companies who are in competition with us are banned, as the new Venus Class design is considered to be a tier 2, or a second line marketing and support web site. Tier 2 sites are restricted in sales. Tier 1 sites are not for sale to any party, and tier 3 are offered for sale to all clients. Passinault has not decided what to do with the Huey Class web site, which was first built and deployed in 2008, and have been very successful. There were three Huey Class sites, and currently, there are barely two online. The Huey Class was derived and developed from the Venus Class, and shares the same technology. A new Huey Class design would also have to solve the content centering issues that the Venus Class has, which would be solved, by default, with the development of the Venus 3. Still, the Huey Class is a good design, so if the new Venus Class site is developed, a new Huey Class is a no-brainer. Passinault may block such sites from sale, however, if he elects to use them to create new marketing support sites for Aurora PhotoArts. When this site is replaced by a Mosaic Class site, our existing directories will be overwritten. We will have a ton of new directories, as well. The new web site and the handover to our new main marketing and support site will happen this Fall. Aurora PhotoArts will be building and deploying a fleet of 24 Mosaic Class marketing and support web sites over the next year, and by the Fall of 2014, the fleet will be fully operational and dominant. Much like the Venus Class, the Mosaic Class sites are 3rd Generation web sites, but late 3rd Generation using proven, effective technology; web site technology which has been cleared for front line use (where we know competitors will be able to look at them). Mosaic Class sites, however, are much more effective, and advanced, than Venus Class sites. 3rd Generation web sites use CSS, mouse-over graphics, JPEGs, and HTML. They are static documents, but are effective, regardless. Aurora PhotoArts is working on more advanced marketing and support web sites using late 3rd Generation technology, such as the marketing and support web sites for our upcoming sister photography company in 2014. Aurora PhotoArts is also working on our next-generation marketing and support web site, the Aurora Class, which will compliment the Mosaic Class starting in 2016, and may eventually replace the fleet. The Aurora Class is a true 4th Generation marketing and support web site, built with PHP databasing technology, flash graphics, embedded video, contextual content, built-in social media, third part social media integration, and full interactivity, since they are fully interactive, fluid web sites; unlike static 3rd Generation web sites, 4th Generation sites are dynamic. The Mosaic Class web sites, although not even close to being as advanced as the upcoming Aurora Class, are designed to be upgraded to 4th Generation standards, and already have embedded video capabilities. With money and resources available, Passinault and his web development team here at Aurora PhotoArts may simply opt to launch new Aurora Class web sites under new operating domain names rather than replace the existing Mosaic Class web sites. With a fleet of at least 24 Mosaic Class web sites, Passinault may elect to maintain and update the existing fleet until 2021 (The Mosaic Class web sites have a 10 year life span, and the site design has already expended over two years being stuck in development), and build and deploy a new fleet of at least 24 Aurora Class web sites starting in 2016, bringing both fleets to 48 web sites. Because the dynamic online document characteristics of the Aurora Class are designed to be easily and quickly updated and maintained, most of the new work would go to the Aurora Class sites. Passinault and his Aurora PhotoArts web team are currently developing the 4th Generation web sites, and resources have been made available for experimental web sites, to be used to develop and test new technologies. These experiments will be used to develop technology which will be used for the first official 4th Generation web sites, which include, but are not limited to, the Destiny Class, the Centurion Class, and the Aurora Class. For more, please see our new blog and news are our new main web site for Aurora PhotoArts Tampa Bay Photography and Design. UPDATE 04/18/12 - New Aurora PhotoArts Mosaic Class site imminent. The next Aurora PhotoArts marketing and support site, V 7.0, is in development. This web site is a brand new Mosaic Class web site, which will replace the Venus Class web site which has been in use for almost seven years. This Mosaic Class site will be the very first one, and will be used as an operational prototype. The Mosaic Class site is a late 3rd Generation marketing and support web site design class, and the Venus Class site which it replaces, which is technically now a Venus 2, is an early 3rd Generation web site. In related news, the Venus Class design will continue on, with the new Venus 3 Venus Class site design being relegated to second line service; the Venus Class site is a proven and stable design which will also be available to sale for clients. You need professional photographers and designers who can give you exactly what you are looking for with minimal time and effort from you. We know that you are busy, and that you want genuine value in what you pay for. You can let our experience and hard work give you the quality which is worth your investment. We are among the most experienced in Tampa photography and design services, so you get more than you pay for. We have years of solid experience and a proven track record with hundreds of satisfied clients, so we don't learn at your expense. With us, you get professional quality and experience, and you deserve no less! We have looked for other companies who can compete with us, and have trouble finding them. Your search for a photographer or a designer is now over. You have what you need. You have us. Discover what we can do for you, today! Modeling Portfolio Photography - Our model portfolio photography services enable models to showcase their range of looks for their modeling careers. We know more about what makes an effective modeling portfolio than model and talent agencies do, because this is what we do. Actor / Talent Head Shot Photography - Actors and talent have been coming to us in droves since 2002 for our headshot photography services, and we have set records. One of our most popular photography services, you will find it difficult, if not impossible, to find a photographer or photography services company which can do a better job with actor and talent headshot photography. We are very proud of the quality of our headshot photography services. All services are guaranteed for quality. We work with the best photographers, designers, make up artists, and stylists in Tampa Bay and throughout Florida! Specializing in model portfolio, talent head shot, and commercial photography. Our services are unmatched in Tampa Bay and Florida, and we offer much more than any other photography or design services company. Model Portfolio Photography: Guaranteed quality. Actor / Talent Head Shots: Top selling service. Our Portfolio: Online Portfolio Core Images updated. Rates: Call (813) 546-0092 for current photography rates. Aurora PhotoArts is the top Tampa Bay photography and design services company. We have been serving the Tampa Bay area since 1994. Our photography services include portraits, wedding packages, actor and talent head shots, business head shots, model portfolios, and commercial photography. Our design services include commercial design, composite/ zed card layouts, actor head shots, high quality printing on 14 pt stock, and web site support. Our services are guaranteed, and we have the highest client satisfaction levels of any professional photography and design services company in Tampa Bay. Model and talent clients are eligible for advanced support services. We have been the leader in model and talent photography and support for the past five years. References are available upon request, and we encourage the participation of friends and family. Request a free consultation today to find out more about what we can do for you! - Pictures that work for you™. © Copyright 1994-2013 Aurora PhotoArts. All rights reserved. Photograph: Tampa Bay actor Jinelsa Rosado, photographed by Tampa Headshot photographer Chris Passinault. Aurora PhotoArts Site V6.2. Venus Class, Venus 2 web site. A founding member of the Tampa Bay Photography Society, a Tampa Bay photography association of professional photographers - True integrity, trust, and quality among qualified professionals. Tampa, Ybor City, Hyde Park, Westshore, Apollo Beach, Clearwater, Clearwater Beach, Saint Pete (St Petersburg), Palm Harbour, Brandon, Plant City, Lakeland, Orlando, Winter Park, Sarasota, Bradenton, Daytona Beach, Miami, Miami Beach, South Beach, Deerfield Beach, Fort Lauderdale, Key West, and Palm Springs. Venus Class Web Site by Tampa advertising agency Eos MediaArts, a Passinault.Com company. Venus Class 0001, commissioned 073107.0900 hrs. UPDATED 09/15/13 - Updated site content. Updated graphics and logo. Removed more outbound links to sister and affiliated sites, and added two more. This should be the final update for this Venus Class site, as it will be retired and replaced by a new state of the art Mosaic Class web site in 2014 (which will give this Venus Class site a service life of around 6 and a half years, as this site was commissioned on July 31, 2007, and the Venus Class sites as a whole a total service life of almost 9 years, as the first Venus Class site, under Passinault.Com, went online on Friday, September 16, 2005. Venus Class web sites were front line marketing and support web sites from Fall 2005 to Fall 2013, which is 8 years, and not a bad run at all; a testament to a good design. There are rumors of the development of a new Venus 3 Venus Class site for second line support and for sale to clients, but this is unconfirmed). UPDATED 05/03/12 - Removed most outbound links to sister and affiliated sites. New Mosaic Class sites will not be interlinked, and will all be stand-alone sites. UPDATED 04/18/12 - After almost a year of additional development, the new Mosaic Class web site for Aurora PhotoArts is about to launch. This Venus Class site will be retired from front line service by the end of the month. UPDATED 04/20/11 - New Mosaic Class marketing and support site is days away; the Mosaic Class site for the Main Aurora PhotoArts site, Tampa Photography Design, which is this one, will be the primary Aurora PhotoArts site, and will be interlinked with the other 15 Mosaic Class Aurora PhotoArts marketing and support sites. This will be the final site update for this aging Venus Class web site. Links to Eventi Events and Eos MediaArts were removed, as those sites have moved, and are in the process of being rebuilt as brand new web sites. UPDATED 04/02/10 - Upgraded Venus Class web site to Version 6.2. Overhauled content, changed link colors, updated graphics, updated background color to a darker gray, and overhauled thumbnail array. Changed template links and cut content on bottom of pages for SEO tweaking. Beginning to add four times the content, and adding new site sections. All four SEO site cores optimized, updated, and brought online. UPDATED 03/14/08 - Updated content for Version 6.0 of the Aurora PhotoArts Venus Class marketing site. © Copyright 1994-2013 Aurora PhotoArts Tampa Bay Photography and Design. All rights reserved.